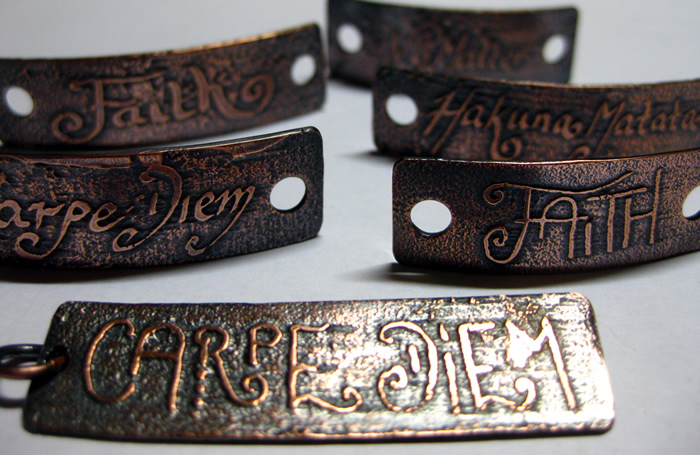 Day 29 – More Etching ! The time between running workshops is great for catching up. 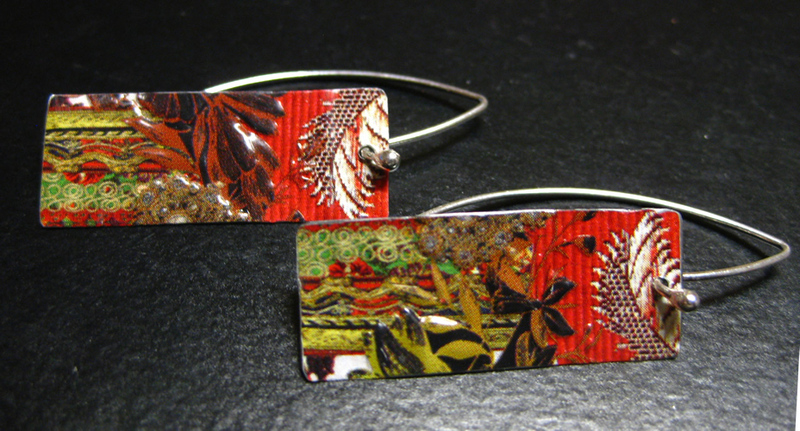 I had promised to make these for Trudi, a great lampwork artist (you can see her work in her Etsy store Glitteringprize). I draw the designs free hand then photograph them and transfer the images to the computer so I can print them on to special paper (PNP paper) in reverse (this has to be done on a laser printer or photo copier using toner). 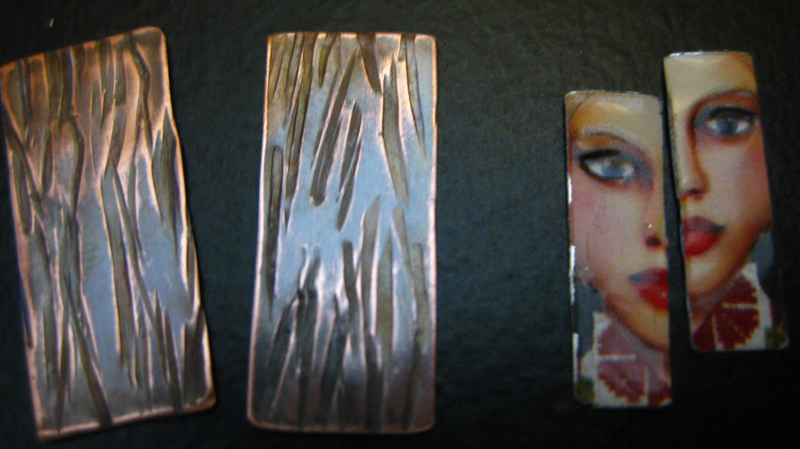 The image is transfered onto the copper using a hot iron. 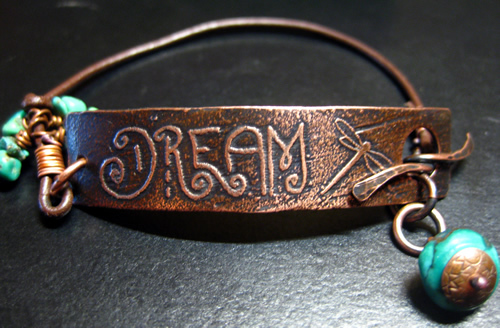 I use the salt water etching method to etch the design into the copper – I like the rustic effect this etching has. The bars are then filed, sanded, polished and liver of sulphured (to give them this lovely soft aged look). These are bracelet bars and can be used with beads, silk (simply thread the silk through the holes and wrap around your wrist), chain etc to make a bracelet. They will eventually make their way onto my website but please contact me if you would like one sooner. Due to the making process each one will be unique. 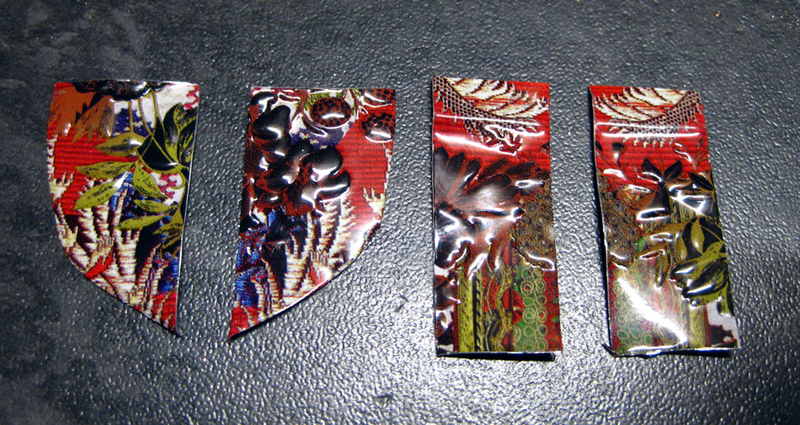 Yesterday I did some glass fusing, just simple stuff in preparation to Chris and Annie’s arrival tomorrow for our next workshop. 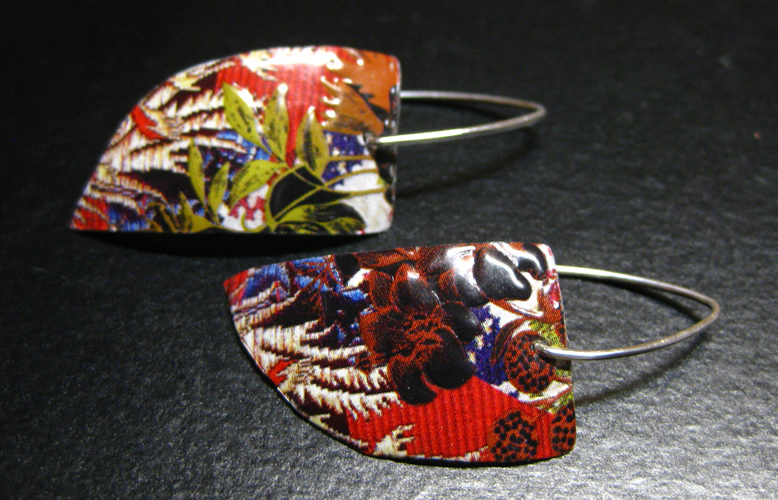 Here are a pair of the earrings I made. I cut 3mm white glass into square and added teal coloured confetti (very thin glass that you can break with your fingers). 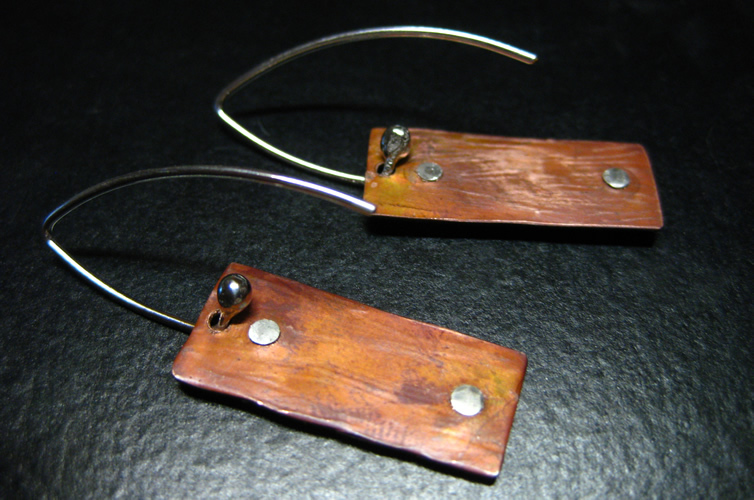 Once fused I drilled the glass and hung them on handmade balled sterling silver ear wires. I’m not sure if I’m going to list my fused glass on our website so I’m starting a separate Dawanda shop – Ginger Cat Glass – which should be up and running in a week or so – In the meantime you can buy these earrings for £15 by contacting me – they come in a cute Ginger Cat Glass tin. 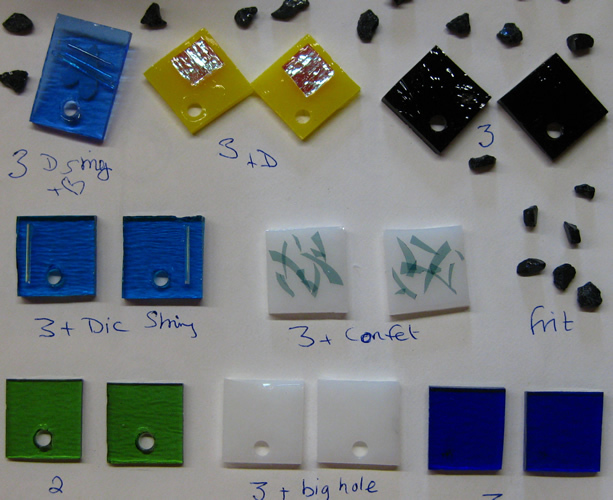 Glass Fusing Workshop – Chris and Annie are coming for our Glass Fusing – Making Fused Glass Jewellery workshop. This workshop has two parts, the mornings are spent cutting and setting up glass for fusing and the afternoons making findings in silver for the glass (techniques used range from making simple silver bails and ring blanks for gluing onto the glass to riveting and setting depending on the students ideas and their experience). 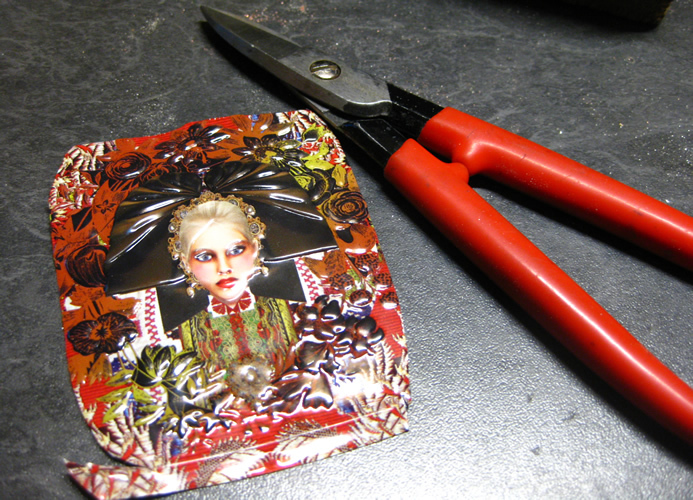 I’ll post photos of their finished jewellery after the weekend. Living in the clouds – This morning I woke up in the clouds (more further down)! We’re at 750m and occasionally the clouds come down and see us, there are other mornings when you can look down into the valley and see the clouds below and when we drive down to the local village we drive down through the clouds and out the other side ! I will try and get phots next time. Day 27 – Lots of Love – Hearts ! PMC is an amazing product – clay made out of silver – you can mold it just like regular clay and once it has dried you fire it either in a kiln or with a torch and the binding compound burns away and you are left with 99.9% pure silver (this is purer than sterling silver). Each one is different and has a textured front and spirals on the back, they come with sterling silver jump rings and are £5 each . Each one is different and I make they a little thicker than most people so although they are small (about 1cm) they feel nice and chunky. The rounds at the top are destined to become my Rock Rose Handmade Silver Studs – So cute. Day 26 – Weird and a Little Bit Creepy ? The copper textured by hammering wire onto the copper, it give quite an organic texture, I then coloured the copper with the torch flame (but you could use liver of sulphur) and slightly sanded the high spots. I then drilled holes in the tin and copper and riveted the tin faces onto the copper sheets with silver wire rivets. 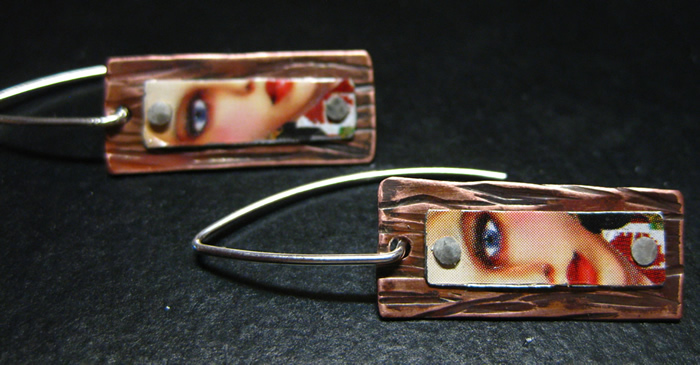 Backs of earrings – you can see the silver rivets. I added handmade silver ear wires (similar to yesterdays) et voila ! 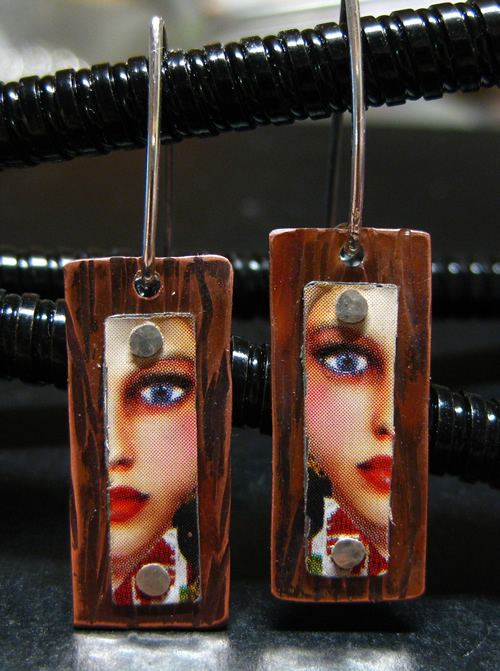 Certainly one of a kind, unusual earrings! I’m selling these for £12. May Make Challenge – I’ve challenged myself to make a piece of jewellery every day in May and post about it – follow my blog to see the next installment ! 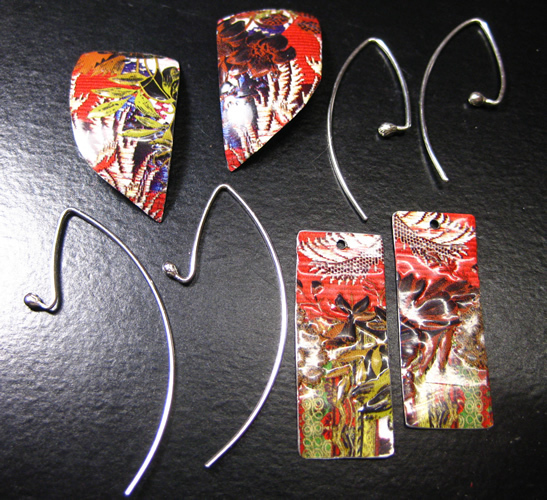 Day 25 – Almost Free Earrings and How to Make Them ! I’ve been meaning to make these for ages….. These earrings such fun to make and so easy. 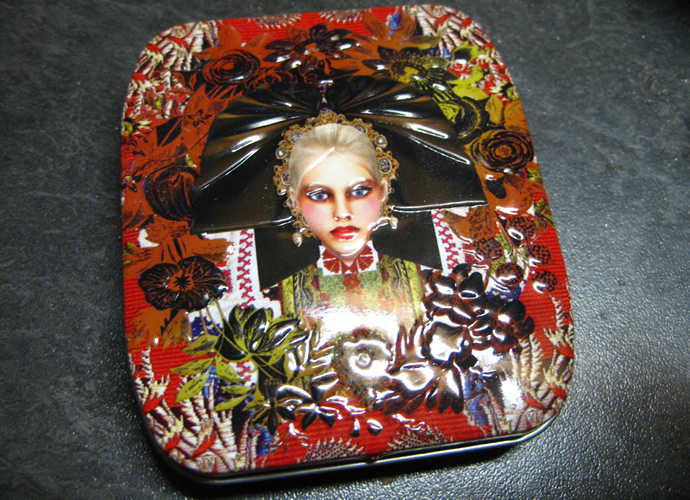 Recently I got this tin free with something. Then sanded the edges smooth and domed the leaf shapes. I then made 2 pairs of balled end sterling silver ear wires (you can learn how to make these ear wires on one of our workshops or buy them from me for £2.30 a pair) – slip the shapes onto the ear wires and voila ! These earrings are one offs and if you don’t fancy making them yourself they are for sale for £10 each pair and come in a cute aluminium tin to protect them in the post – Just contact me via contact tab. Days 22-24 Lots of Ear Wires & Cows ! Hammered strips of copper curved and soldered onto silver ear wires, these earrings come in a cute aluminium La Vidalerie tin to protect them and are only £10 a pair ! Day 23 – Mostly Ear Wires ! I am passionate about handmade jewellery and really feel that when you design a pair of earrings you should also choose the ear wire style (long, short, fancy, plain, curved, curly etc) to fit the design – this is why we have over 50 different ear wire designs on our website all designed and made by, well, me 😉 This photo is just some of the ear wires I made for order on Friday. 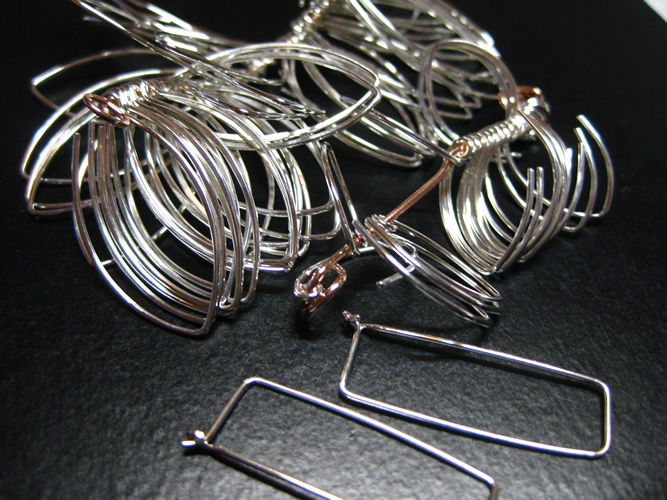 If you are still using mass produced ear wires why not give our ear wires a go and see the difference they make to your designs – or you could of course come on one of our jewellery making holidays and learn how to make your own ! 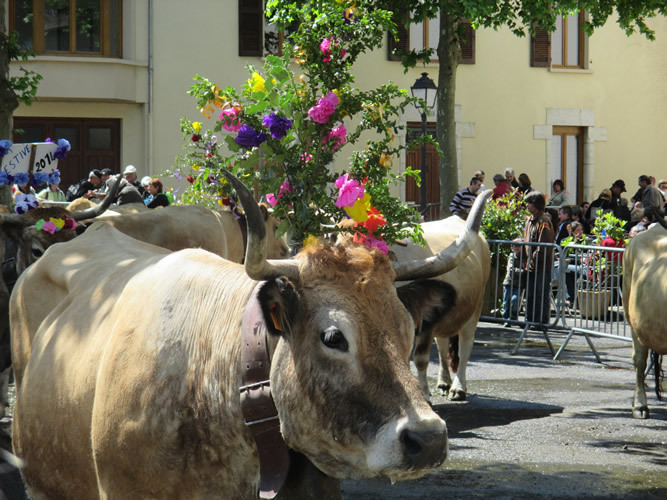 This is a very important week-end for our area, traditionally a time when the cows were walked back up to the high plateau of the Aubrac to pasture. Now days most of the cows are taken up by lorry but some are still walked up as part of the festival and a lot of walkers join them. 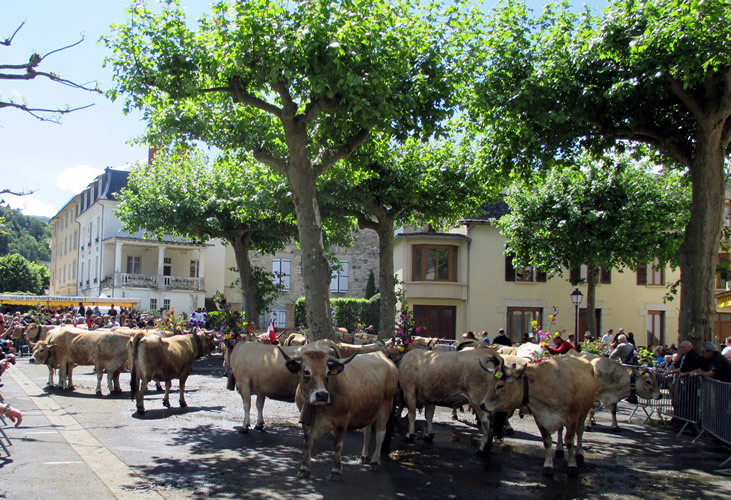 Before walking them through the village and on up to the Aubrac. 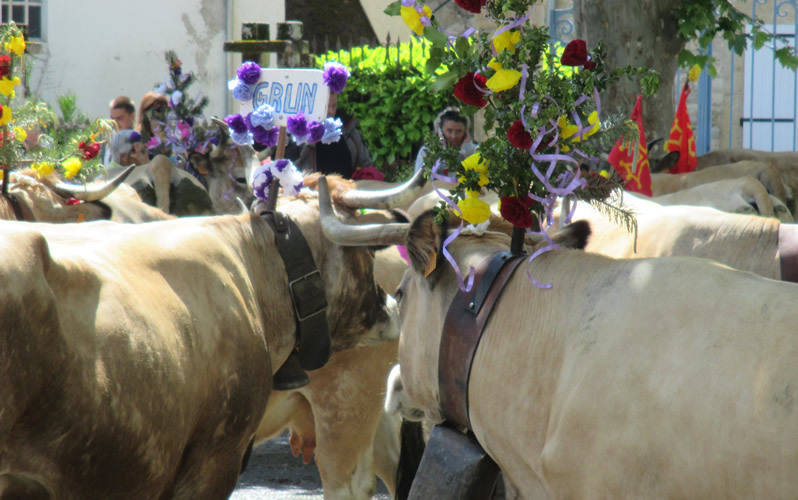 It marks the end of the winter, the coming of summer and is a good excuse to celebrate with the traditional music and dancing in the background, a market and tables for lunch being set up in the streets. 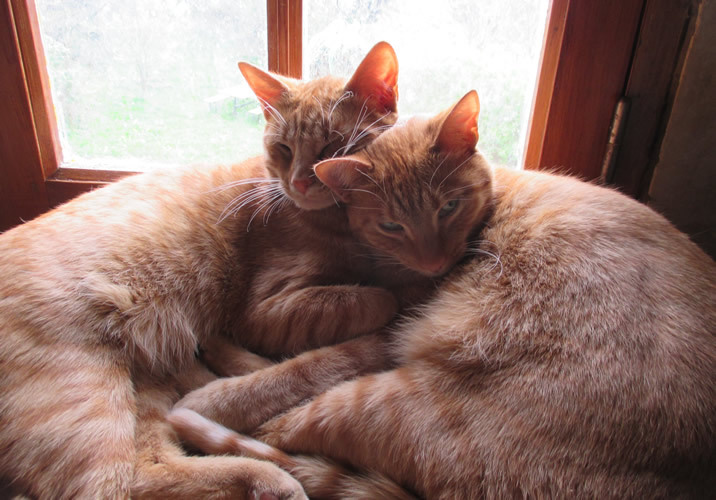 That’s Katto on the left and Tom Tom on the right, possibly related as they were rescued from the same place but with a large gap between them, Tom Tom is top cat with funny teeth and Katto is a big lad with a broken tail which might be genetic- Well try as I might I DO sound like a mad cat woman ! 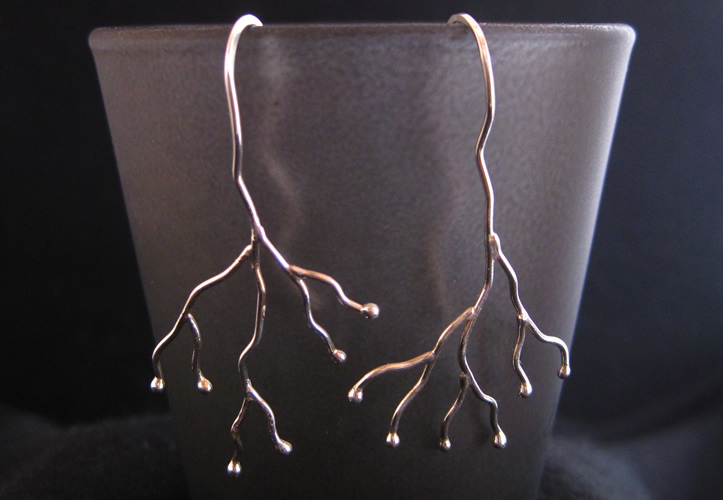 May Challenge – I’m trying to make a piece of jewellery every day in May and post about it .